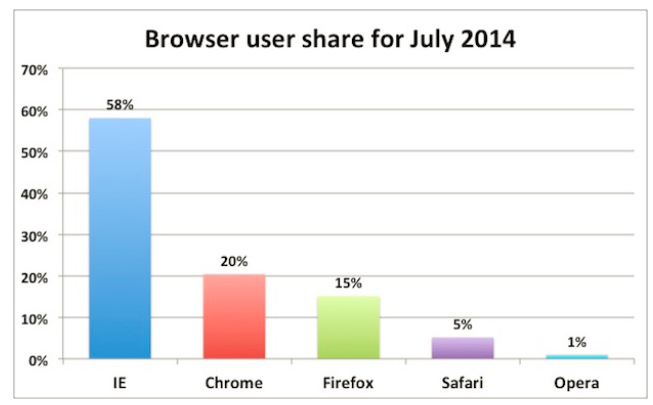 I saw this chart today and I was shocked that 58% of people on the internet are still using Internet Explorer as their browser. I usually have Internet Explorer, Firefox and Chrome open simultaneously because I have to toggle back and forth between multiple email accounts on multiple screens (I am involved in multiple businesses), but I always use Chrome as my main working browser. Chrome's share of the market is growing fast (it just recently passed Firefox), but I'm surprised it is not growing faster. As a fair warning I may be slightly bias because I use Google for everything; gmail, blogger, calendar, tasks, insightly, maps, search, drive, finance, adsense, youtube, play, docs, voice and probably others that I can't think of.